This super simple Puppy Paw Paste has become my go-to thing for schmearing on Lottie’s paws before we head out for snowy walks. Lottie has hilariously fluffy wookie feet and legs. Her feet appear to be roughly three times bigger than they actually are thanks to her adorably floofy feet. In addition to all the fur you can see, she’s also got quite a lot of it coming out from between every pad in her wee paws. All of this fur is a total snowball magnet in the right conditions. She’ll be covered in snowballs—they’ll dangle off her from the belly and all down her legs (I usually have to give her a bit of a luke-warm spray down in the shower when we get home otherwise she’ll be melting all over the house for the next hour). When there’s lots of wet snow, something to keep it from glomping all over her feet is a must. This Puppy Paw Paste is what I’ve been reaching for. Today’s Puppy Paw Paste rather happened by accident. You see, more or less exactly this was one of the experiments I did as part of my Formula Botanica Diploma of Organic Skin Care course last February. Right around then Calgary was absolutely slammed with heavy, wet snow. 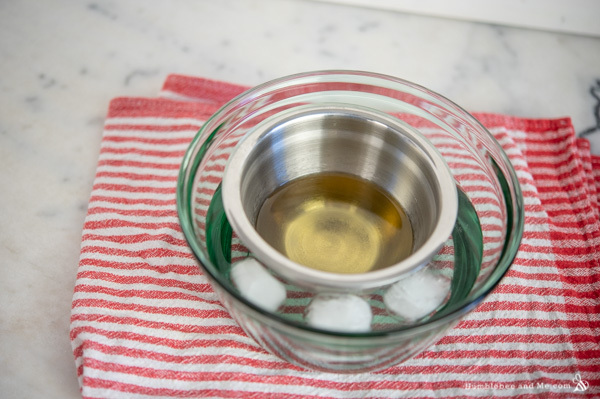 I found myself needing something for Lottie’s paws as they were becoming bogged down with snowballs to the point of impeding movement… and I just happened to have over a dozen jars of various oil-and-butter experiments in the kitchen. This one quickly rose to the top of the heap and became my Puppy Paw Paste. I’ve been wanting to share it with you for ages, but I needed to wait until it was winter again (by February I had things planned into the spring already), and then when winter starts it’s all about the Christmas DIYs. So here we are, in the heart of January, with a treat for some puppy feet! Puppy Paw Paste is simple. Three, easy peasy ingredients. Soft, creamy mango butter. A lightweight oil—I used sweet almond, but apricot kernel, safflower oil, or grapeseed oil would all be easy alternatives. There’s a touch of vitamin E oil to delay the onset of rancidity… and that’s it. 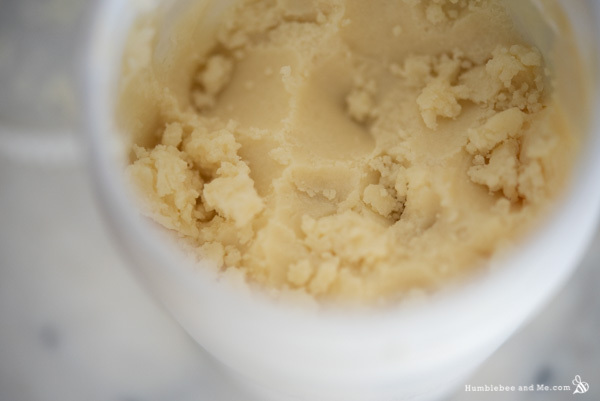 There is a bit of a trick to making the balm. We’ll be gently melting the mango butter, adding everything else, and cooling the mixture to trace in an ice bath. We won’t, however, be putting the balm in the fridge to fully set up. I found that doing this causes two unpleasant things to happen. Thing 1: as the balm returns to room temperature it oozes out some liquid oil around the edges, which is weird. 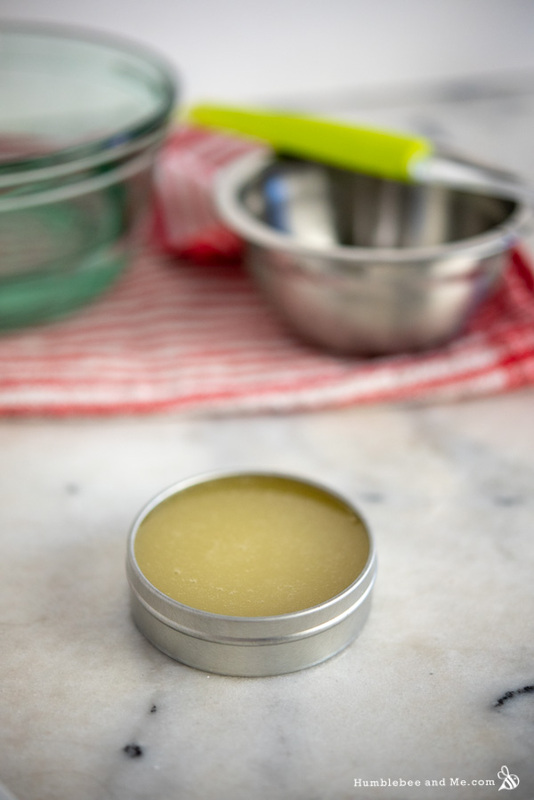 Thing 2: the balm takes on a peculiar and less-than-ideal mealy consistency. So, just don’t—let it cool at room temperature, and you’ll be a happy camper. To use, smear a healthy amount on each dog paw before a walk. I find it prevents snow build up perfectly, and by the time you’re home from your walk it has worn off so you won’t end up with greasy paw prints all over your floors. Lottie is much more interested in what’s in my hand than what’s on her paw, so while she tries to lick it off my fingers she never notices what’s left on her feet. Puppy Paw Paste makes winter dog walks better. Booyah! Weigh the mango butter into a small heat-resistant bowl—the sort of thing you can comfortably stir in. 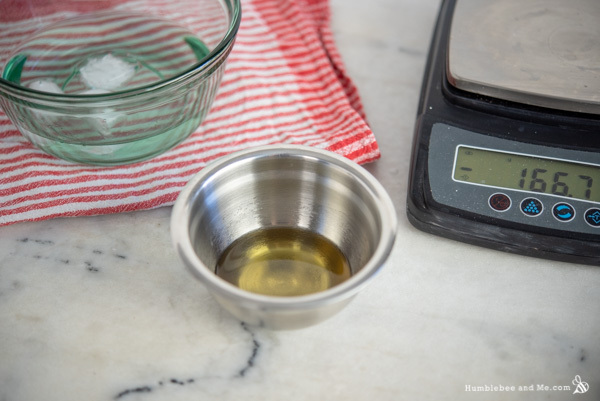 If you don’t have a small bowl, a heat-resistant glass measuring cup will work. 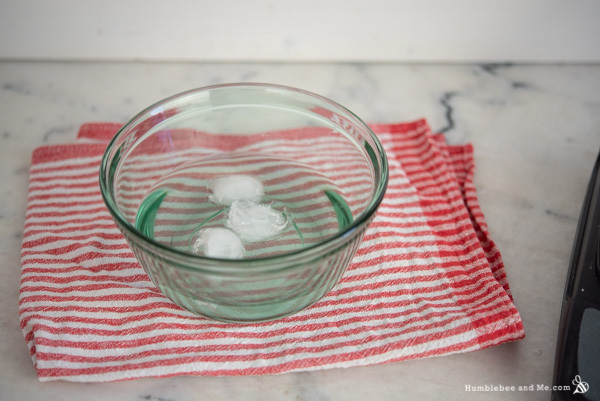 Place the bowl in your prepared water bath to melt everything through. Once the mango butter has melted, remove it from the heat and stir in the sweet almond oil. Then place the bowl in the ice bath and stir constantly for about one minute, until the mixture has cooled a bit but hasn’t noticeably thickened or started to opacify. 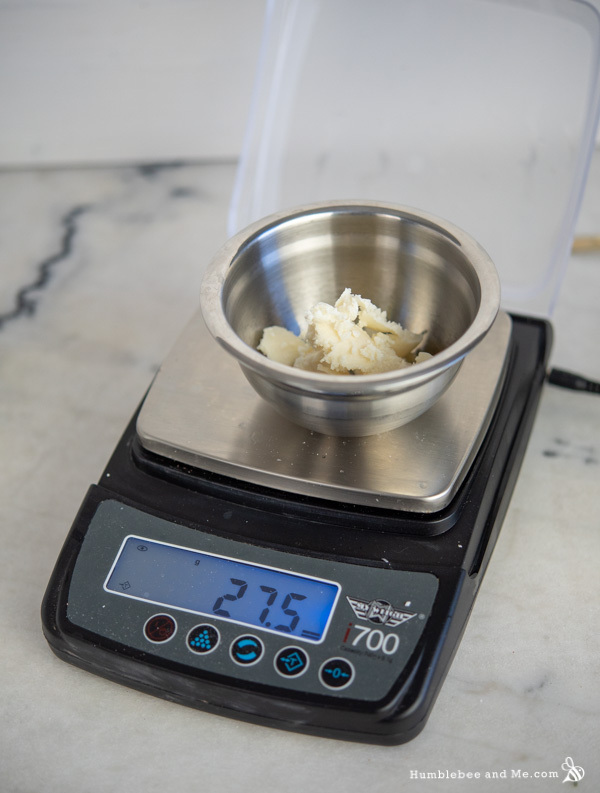 Weigh in the vitamin E.
Stir to combine, and then continue stirring the mixture in the ice bath until you reach “trace”—the mixture should have enough viscosity that a small amount drizzled over the surface of the mixture leaves a “trace” for an instant. The mixture should also appear a bit hazy. If you’re a soap maker you’ll be familiar with this—we’re looking for a very light trace. Refer to the video to see it in action! When you have reached trace, transfer the mixture to a 30mL/1 ounce tin and leave to set up for at least six hours (though I found it will continue to set up/mature for about a day. Do not refrigerate. That’s it! To use, smear a generous amount on your dog’s paws before wintery walks. Enjoy! 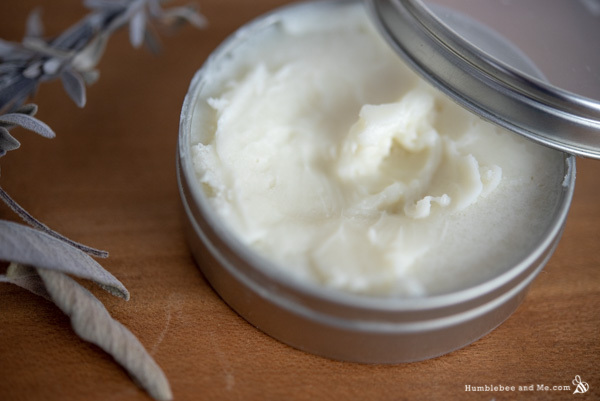 Because this balm is 100% oil based, it does not require a broad-spectrum preservative (broad spectrum preservatives ward off microbial growth, and microbes require water to live—no water, no microbes!). Kept reasonably cool and dry, it should last at least a year before any of the oils go rancid. If you notice it starts to smell like old nuts or crayons, that’s a sign that the oils have begun to oxidize; chuck it out and make a fresh batch if that happens. As I’ve provided this recipe in percentages as well as grams you can easily calculate it to any size using a simple spreadsheet as I’ve explained in this post. As written in grams this recipe will make 55g. I don’t recommend swapping out the mango butter, but if you have to use refined shea butter instead that’s ok. It will make for a greasier end product. You can use a different light to mid-weight liquid oil, as outlined in the post. Do not add any essential oils. They are totally unnecessary and can be harmful to pets. Omg I had my friend ask this morning if I knew of a recipe for her pugs paws! Then your recipe pops up! Thank you so much ! I will let you know how it goes as we live in SA and we don’t get snow but rather hot sand and pavement. How cool! I’m not sure how this’ll work against hot pavement, though—it works on snow because oil and water don’t mix, so the product repels the snow and stops it from building up. I’d think sand would stick to it—maybe booties would be a better option? So crazy, i also live in South Africa and was wondering if this would work with my dogs. As they get cracked paws on the pavement. I’ve usually just put olive oil or omega oil on their paws when they’re resting. Sure they lick it off but its kept their paws in good shape after a long walk. Love the calendula infusions for healing help. 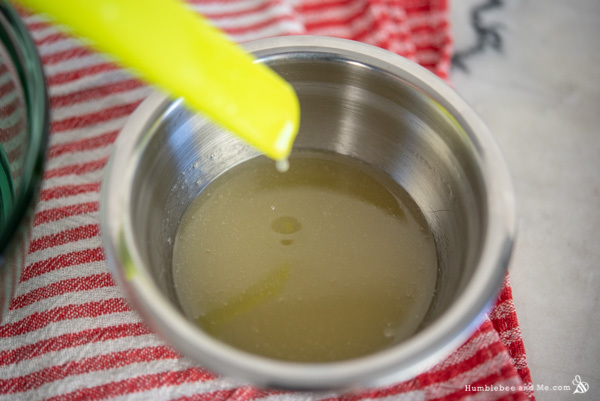 I know it’s not quite the same as a dog’s paw but I make a calendula infused balm for my budgie’s feet when they are a bit dry or looking a bit sore and it works amazingly! Is this protective from cold weather how does it compare to the protective wax recipe? In other words what’s the purpose for this one? HEY IT WORKS FOR South african dogs!! I added bees was and raw shea butter and equaled it out its now perrrrfect for south african dogs and they love licking it but no more cracked heals and sore snots!! Marie this sounds amazing & I can’t wait to make some for our Pom! He has long hair on his legs and down around his feet also lol.. Just an FYI our vet recommends clipping those long hairs between the toes as she says it will rub and irritate their toes and make them sore. This may help a little to keep so much snow from collecting on Lotties adorable feet! Thanks! Much Love! Thank you dear Marie! I do love all the information and beautiful recipes! Living in Michigan’s Upper Peninsula, the puppy balm is very important for our canine friends who enjoy romping in the snow! I also slather it on the combs of my hens and roosters, even though they are in coops, with heat lamps, they like to go out if the temperatures rise a wee bit above freezing. My Goatie girls enjoy a brushing and moisture rub of the balm on their noses and if they allow me, their hooves after a goatie hooficure! 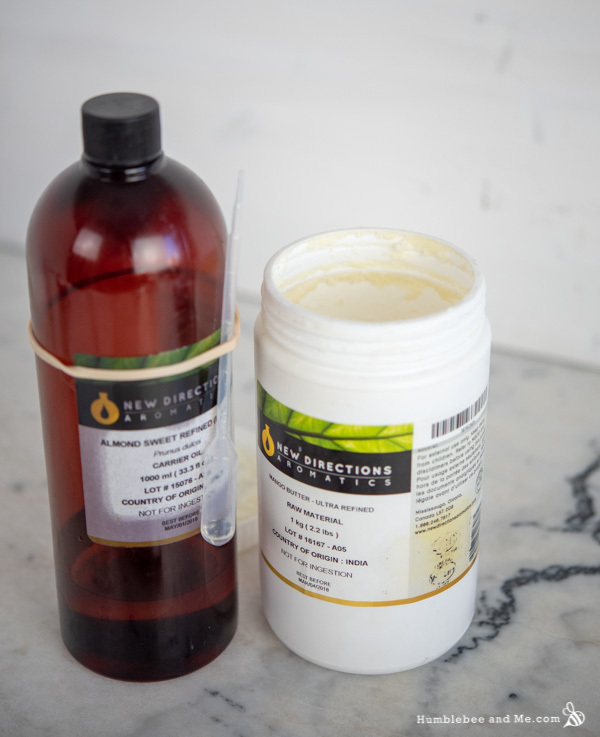 Can I use vanilla extract instead of benzoin/vanilla essential oil?